TopMics artist showcase is a platform for indie artist to exhibit their talents. Their show in Atlanta brought out a few fresh faces and some known ones as well. The event was presented by DJ 3000 of 3000 Ent at Knockouts bar and lounge. The crowd was vibrant as the artist showed love to each other. The special invited guest of the night were DJ 7Thirty and Joe Rugby of Tape Hustlers and previous TopMic winner Golidlox. Salute to the artist of the night, some caught my attention but only a few captured it so I had to shine some light on these artist. The name is Bob Whyte and I’m from little old Boynton Beach, FL. I have been writing music for as long as I can remember but, I wish I pursued my music career sooner. Some might say I have a trap sound, but it’s hard to put me into a box. I have days where I want to make music for the block and other days where I want to sing like Adele. Some of my influences include: T.I., T-Pain, Future and Birdman. I learned a lot from dealing with multiple personalities but eventually like most greats, I decided it was time to turn into a one man army. I’ve performed from packed clubs as well as in front of nothing but tired bartenders and janitors. The quality of the work speaks for itself and five years from now I’ll be saying I told you so. Be on the lookout for my debut project titled “Whyte Power“. Follow me on social media @bobwhytebrand, Contact me at 561-414-2420. My music is available on SC, Spotify, Apple Music etc. I just want to tell anyone trying to better their lives or who are chasing their dreams to keep doing so no matter what. You will die alone so don’t live with regret, GO FOR IT and DO WHAT MAKES YOU HAPPY!! S/O to Keedie’s Corner and Tape Hustlers!! I’m GrittySound, hailing from Baltimore, Maryland, currently in North Carolina. I have had a love for music since the age of 3 years old, when I first started playing the drums. Later, I began working on my vocals in hopes of becoming a singer one day. Here is some of my music (click the link) to give you some insight to help you understand my style. Meanwhile, growing up I was also practicing other instruments such as violin, and piano, which I often plays in the background of some of my tracks. Striving for greatness and success everyday, I soon hopes to reach the top. Follow me on social media at; Facebook: Davon Mooring, Facebook Artist Page: @grittysound, Twitter: @GRITTYSOUND, Instagram: @GRITTYSOUNDMUSIC and on Snapchat: @grittysound. Shoutout to all my Bmore and NC family and Keedie’s Corner for the opportunity. For all the artist out there just remember “faith without work is dead”. My name is Iczey Kashmere most call me Kash, I am an aspiring singer. I was born in Winfield, AL and I moved to New Orleans around 12. I wrote my first full song at the age of 10. I started writing and it just took off from there. I loved to sing and writing was my passion. I moved to NYC at 18 to pursue a music career and I haven’t looked back since. I have been doing shows this year and I am loving it. I have so many musical influences. I grew up on oldies because my granny raised me. My mother was an 80s baby so my collection is from Al Green to Anita Baker to Beyonce. My first tape was Al Green’s greatest hits. I recently did a show in NYC and I’ll be in Florida next month at the Indie Music Festival. Check out my single “Good Life” and be on the lookout for more! I want to thank Keedie’s Corner for everything and for showing me love. I want to shoutout my team for being supportive, Contact me at 504-428-9524. Follow me in social media at IG @IczeyKashmere and Twitter @Iczey. My words of advice is to always be inspired my inspiration. Let your creativity move you. Other artist of the night were well worth mentioning, shout out to Natural Onxy, B Ford, OG Redd, Shania the Artist, King Redd and Re-ill. When I presented the opportunity, the featured artist promptly responded and I respect professionalism and hunger, so once again, salute to these artist in the spotlight. Allow me to reintroduce myself!!! And for many of ya’ll this will be the first of many interactions that we will have together. I am DJ 3000, I’m bout to drop my own honest reviews and opinions through #ViewsFromDaBooth. #ViewsFromDaBooth will be my personal account of the good, the bad, and the why the f**k would an artist do that. #ViewsFromDaBooth is what I see as a DJ and what I feel an artist needs to do to reach that exclusive next level. Let’s get it. Last week I DJ’d two artist showcases in Atlanta. Both of them had excellent turnouts with rappers hyped to bless the stage, artists with radio-ready songs, and performers with hidden talent. Both had experienced artists as well as entertainers performing for their very first time. But two IMPORTANT things were missing from all artists in attendance: they didn’t leave material with the crowd, nor contact info with the DJ! What good is a high energy, catchy-hook performance, if you don’t leave the crowd your music? You didn’t leave the crowd a cd of your song (or mixtape), flyers for your next performance, or even rally towels with your logo for branding. How are they going to follow up with you and begin being a fan? Why did you even perform? Just to post an Instagram video? Bruh, what better way to gain fans, than by giving them something to remember you by? Screaming your IG name out at the end of the song will do nothing. Have you ever heard someone in the crowd say “repeat that IG name fam”? No. Why, why, why, do you come shake the DJs hand, tell him this that and the third, exchange meaningless contact info, but not give him a true reason to PLAY your record when you’re not present? Leave me something. Anything. A flash drive with your hit record, business card, or even email me your music (and follow up, but that’s another topic). Don’t bring a performance CD and then ask for your CD back. USBs are cheap, leave me one, go get another. Why get my info and never send an email for thoughts on the record or ask if I can put it into rotation for you? Artists, you got to do better. These are my #ViewsFromDaBooth. I have witnessed artists that have hot songs, but no physical material to promote to potential fans. Nothing to help them brand themselves and set them apart, nothing to make me remember them by or want to even play their record on a hot club night. Leave the crowd something, you will gain potential fans, trust me. Crowd Control Broke The Knob!! Crowd Control was a concert to remember. Marley Paper Boy and Lennoxx CEO of Flyboyz Productions provided a historic platform for the independent hip hop scene of Atlanta with over 500 people in attendance. DJ Chopsticks manned the turntables while the legendary voice of Fort Knox kept the crowd entertained. Crowd control was an example of how powerful the Underground Atlanta Hip Hop culture has become. The show had several standout performers such as: GFZ Smurfey, Ovadoze, Jake Manino, Young Bo, Fleetwood Fred, Wolf and Nardo, Ze Forte, IMP D, Dan Diego, CJ The Drummer, EWC3, Ryan Milla, Young OG Rob and the list goes on. Club base was at capacity from 9pm to 3am, the diverse crowd showed great energy the entire concert. The New Atlanta movement is impressive. 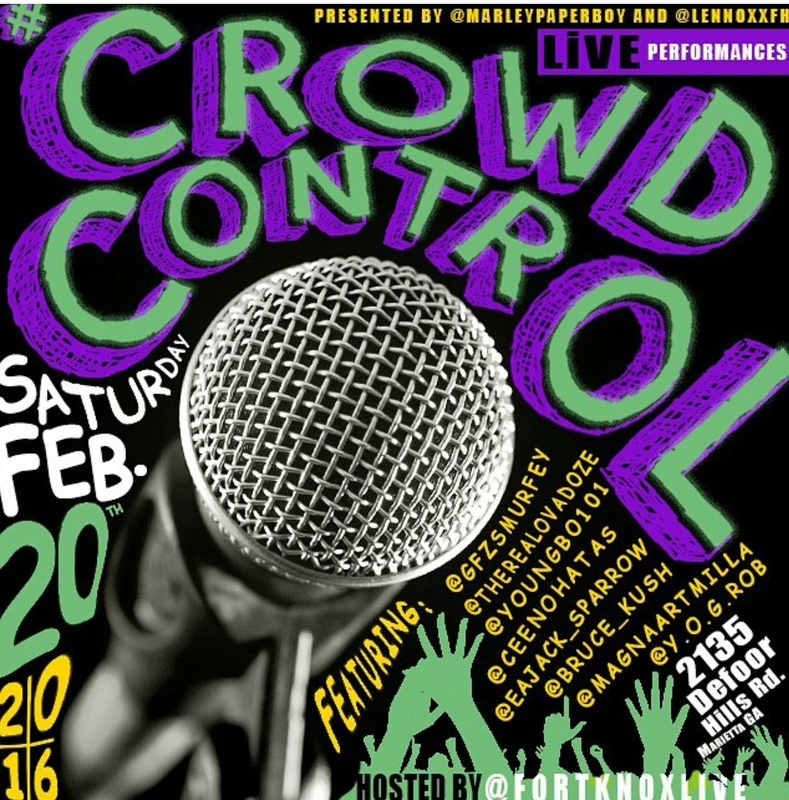 Crowd Control was inviting and refreshing providing much needed creativity and innovation for hip hop culture. Keedie’s Corner will be there to tell the story as the New Atlanta movement grows, so stay tuned.